There are many great leaders in today’s workforce who help drive company success, but there are also many bad bosses who lead teams, and the companies they belong to, downhill. This post will look at 8 facts about bad bosses in today’s workforce and offer simple tips to turn your bad-boss habits around, so you can be the best leader you can be. <a href=”https://www.officevibe.com/blog/facts-about-bad-bosses-infographic”><img src=”https://assets.officevibe.com/infographics/infographic-8-facts-about-bad-bosses.png” data-no-lazy=”1″ alt=”facts about bad bosses infographic” width=”600px” border=”0″ /></a>This infographic was crafted with love by Officevibe, the platform that helps you to <a href=”https://www.officevibe.com/employee-engagement-solution/leadership”>be a better leader</a> and make your employees happy. 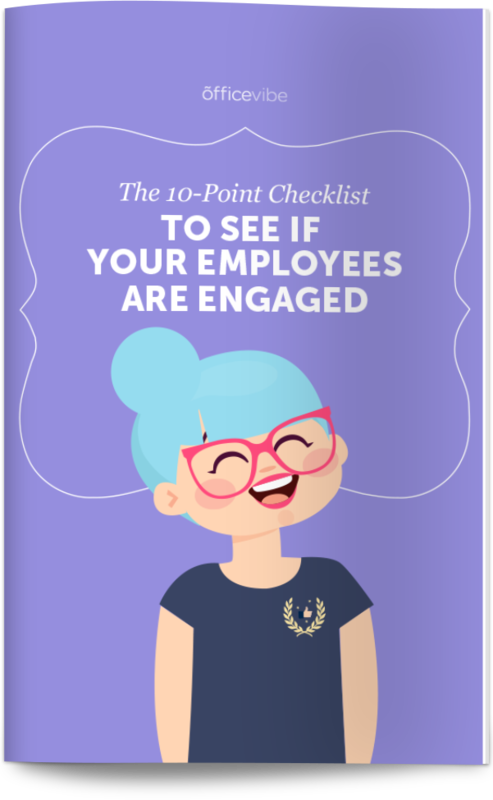 Download the complete checklist of the 10 most important metrics you need to focus on to be a great boss. Unrealistic expectations of managers account for 22% of workplace stressors. Having ambitious goals for your team is great, but you need to be sure that what you are asking of them is not completely unrealistic. The reason for this is that it can be very demotivating for employees to not meet goals or fulfill the requirements you set for them. Motivating your team to reach for the stars is great, but it has to be within reason. Set Realistic Goals: Don’t just tell your team to deliver, help them get there by providing the resources and structure they need to achieve their goal. This includes helping them map out a clear plan of how they can reach the goal, and checking in often. 70% of employees haven’t received recognition from their manager in the past week. This statistic is quite disappointing, especially since recognition is the catalyst for motivation, which is what keeps your team productive. We learned to say “thank you” to strangers who do so little as hold the door open, so how is it then that there is so much neglect in thanking the people who day in and day out put their all into making their managers proud and company successful? Employee appreciation, when done right, will help increase productivity, engagement, team morale, and therefore retention. Recognition isn’t just about implementing employee programs to check them off a list; it’s about bringing out the best in people and improving your company’s bottom line. Recognizing your team should not be confused with empty praise. People work hard and feel proud of their good work. Share in this enjoyment often, and you are sure to see a team of happy, willing employees. How To Show Recognition: Celebrate wins – Don’t let hard work go in vain. Take your team out for lunch (or pizza-party in the office) to recognize their efforts and show appreciation. 60% of employees don’t feel that their employers care about them. It seems obvious enough to say, but in the hustle and bustle of the workday, we sometimes forget that employees are more than just employees. They are also parents, students, caretakers, and potentially many other combinations of roles. People have lives outside of work; hobbies and passions that make them unique. Showing interest in this is one way to differentiate bad bosses from great leaders. Learn About Your Team: Dedicate time to team bonding! Before we start working on Monday morning, we all huddle together to talk about our weekends (which, without fail, commences the day with a good laugh). Likewise, on Friday, we make it a point to eat lunch together as a team, removed from our computers. It humanizes work, making the daily processes so much more meaningful and enjoyable. More than 75% of employees don’t feel they receive meaningful feedback. Employees want to improve, and in order to do this, they need your feedback, whether it be positive and encouraging, or critical. Not all managers enjoy the feedback process. We get it. It can be difficult to point out people’s shortcomings, but the truth is that they likely want to know. Wouldn’t you want someone to tell if you had spinach in your teeth? Yes, you would. Here’s an article on how to get more comfortable giving feedback. Instead of just pointing out faults, a great leader will also strategize on how employees can improve, setting short term goals and OKRs, as well as offering resources and tools. Giving Feedback: Hold monthly one-on-one meetings in place of annual reviews to allow employees to improve on a consistent basis, and therefore achieve the goals that you set for them. This will increase their overall morale, which will boost their productivity. 77% of employees don’t feel that the leadership of their organization communicates effectively. It means simply making it a point to say good morning to your team. It refers to communicating respectfully both verbally and in an email. It means communicating everything with transparency in order to keep everyone in the loop, and part of the larger picture. It also means having an open door policy to let your team know that you are approachable if they have anything they need to communicate to you. It basically means everything to your company. No relationship in the world can survive without proper communication. That’s why continuous feedback tools are so important for companies to implement. It helps employees share what’s on their mind (confidentially), so managers can work on finding solutions. How To Communicate Effectively: Hold monthly one-on-ones, creating a safe and set place for your employees to share their thoughts, and for you to offer feedback. And, on a higher level, hold monthly Town Hall meetings (with the whole team) to communicate important points. Ask Yourself, Are You Engaged? Managers account for 70% of variance in employee engagement. According to Gallup’s 2015 State of the American Manager, the percentage of managers that are engaged in the US workforce is only slightly higher than the percentage of employees are engaged. So, there is a direct correlation between engaged managers and engaged employees. The old adage, “the apple doesn’t fall far from the tree”, suggests that if a manager is disengaged, so too might the employee be. It’s important as a manager to check in with yourself as much as you check in with your team so you can lead by example. How To Stay Engaged: Go through the same processes that you ask your employees to go through, such as have one on one meetings with your superior, set personal goals to track, and practice work-life balance. You are there for your team, but remember that you are part of it and have needs as well! Actively disengaged managers (14%) cost the US $319-$398 billion annually. Just because you’re a boss, it doesn’t mean that you are always going to be magically on, happy, and engaged. You’re a person too, and you have needs. If there is something not working for you in your workplace, share your concerns with your own superior and see where you can find solutions together. Be a superhero for your employees, but also for yourself. What To Focus On: Take an audit of the things that are not working for you and bring it to your direct report. Here are ten important metrics to consider. See where you can work together to improve things. One of two employees say they have left their job to get away from their manager. Employees don’t necessarily quit their jobs, they quit their bosses. This fact is sort of the amalgam of all the above facts and stats, ultimately suggesting that being a bad boss can result in the grand exodus of your employees. In order to earn their respect, you need to first and foremost be respectful towards them. The relationship between manager and employee is one that requires reciprocity. Respect is a two-way street. If you don’t respect your employees, I can guarantee they aren’t going to respect you. Calling them out in front of customers, failing to recognize their achievements, and not listening to their feedback are all signs you don’t respect them. Respect can mean a number of things, but here is some top-of-mind insight that you can easily implement into your day to day. How do you plan to be a better boss? We love to learn from great managers around the world.